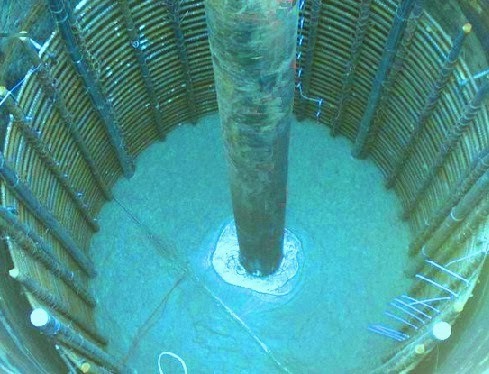 We have discussed about many aspects of concrete for bore pile foundation. In bore pile construction relatively much greater slump is required as discussed previous. Here we will discuss about workability class A and B in relation to specific purposes of concreting in bore pile. Different testing of concrete are undertaken to ensure quality of concrete. Of these here we will discuss about workability. This is very important in bore pile construction as concrete has to travel through congested reinforcement and at greater depth too with unfavorable condition beneath bore hole. The most popular measure of workability of concrete is slump test. It shall be conducted for each truck load. Following standard discussed below should be followed unless other requirements are posed measuring of slump during discharging concrete into pile shaft or during discharge into hopper of concrete pump. In case of tremie concreting, concrete pump should not be used directly. The specification of concrete should be provided with adequate enrichment in cement content to allow this high slump concrete mix. An alternative can be permitted, providing additives for retarding setting of concrete to ensure remaining concrete workable for extended period after placement. The contractor should include either provision in calculating unit rate of piling.